The town of Dun Laoghaire has a thriving food and drink scene. One look at the new trail maps published by Dun Laoghaire Town will confirm this. If you want to go for a meal, drink or coffee in the area you really are spoiled for choice. 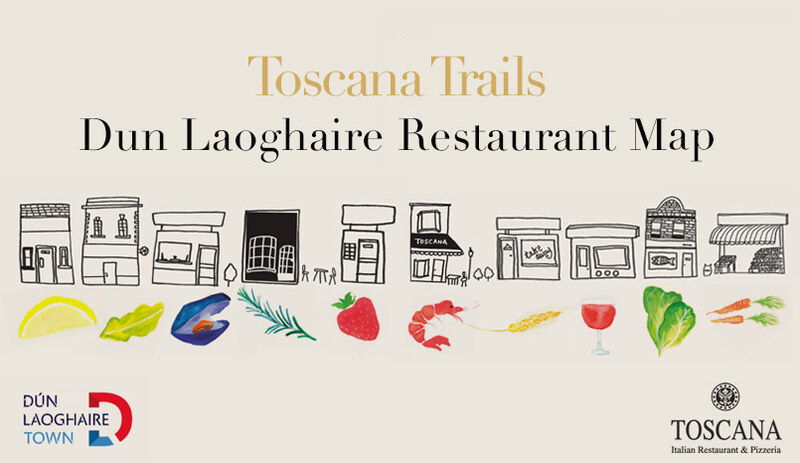 Whether you are here on holiday or from the city or a local, the trails offer an enticing way to experience Dun Laoghaire’s vibrant restaurant, pub and café culture. Just tick off the places you want to explore or the places you have already been to. It’s a fun way to experience what the town has to offer. These maps are very informative, so you can decide on which places would most likely suit you. Few visitors will have the time to visit every restaurant, pub and café in Dun Laoghaire. These maps give you enough information to select which places you are more likely to enjoy. They are the perfect way to plan where you are going to eat and drink while you are in town. Whether you are single, a couple or a family, whether you are a food lover, a coffee lover or a pub lover (or an Italian restaurant lover) you can decide on the places that appeal to you the most. These maps are very handy for visitors to Dun Laoghaire but they also help the local economy. By showing all the town offers in terms of restaurants, pubs and cafes, the visitor will make time to check out the places that appeal to him. Instead of visiting just one or two establishments he will find it hard to resist exploring more of what the town offers. 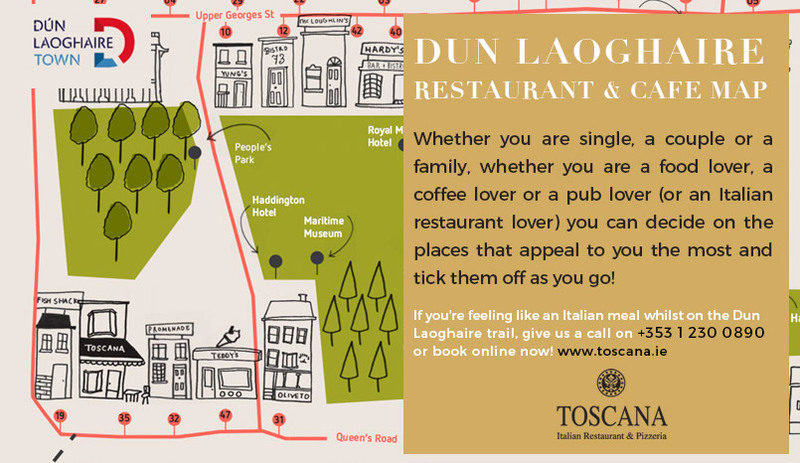 Having a map also makes it more likely that the visitor to the town will discover a restaurant, pub or café that he enjoys in particular, and will make him want to return to Dun Laoghaire in the future. There are many outstanding places to visit on the trail. Avocado restaurant on Sussex Street offers the finest Asian food in the town, especially Chinese food. If you prefer Indian cuisine why not try The Jewel in the Crown restaurant on Upper George’s Street. They serve a vast selection of delicious Indian Mughali dishes. The Bistro Le Monde on Crofton street is the latest gourmet destination to open in Dun Laoghaire and serves cuisine from all around the world. If you are going out for a drink there are plenty of excellent pubs on the trail. O’Neill’s Irish pub on Upper George’s Street has everything you could wish for in a pub: great atmosphere, great food and drink and, of course, great craic. Gilbert & Wright on Lower George’s street is a retro 70s themed pub with laid back atmosphere and entertainment seven nights a week. On Dunleary Road you will find Dun Laoghaire’s oldest pub, The Purty Kitchen, which has a reputation for great food, especially sea food. The café trail also has its gems. La Dolce Italia on Patrick Street offers authentic Italian colazione as well as genuine Italian breakfast with croissant and expresso. J.J. Darboven on Lower George’s Street is famous for its premier coffee, tea and hot chocolate including Alfredo Expresso, Eilles and Windsor Castle Tea and Cocaya Hot Chocolate. 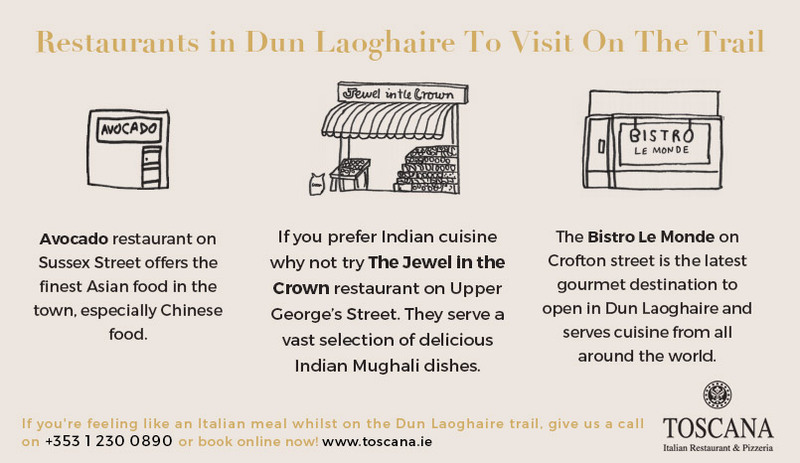 So, if you are a local or visitor to Dun Laoghaire, and you want to check out what the town has to offer in terms of coffee, cuisine and beverages, consult the maps and there is no knowing where you will find yourself or what gems you will discover. It’s an exciting way to experience a rich restaurant, pub and café culture that the town is very proud of. And, if you’re feeling like an Italian meal whilst on the trail, give us a call on +353 1 230 0890 or book online now! Thanks a million for sharing. Delighted you guys like the map.